Donald Trump and Mike Pence landed in Louisiana today to survey the damage from the floods as well as talk to residents and officials. Obama couldn’t tear himself away from his vacation, and Hillary’s taking a rest break. President Barack Obama is unlikely to break from a New England vacation to survey flood damage in Louisiana, despite calls for him to visit and meet with responders and victims. 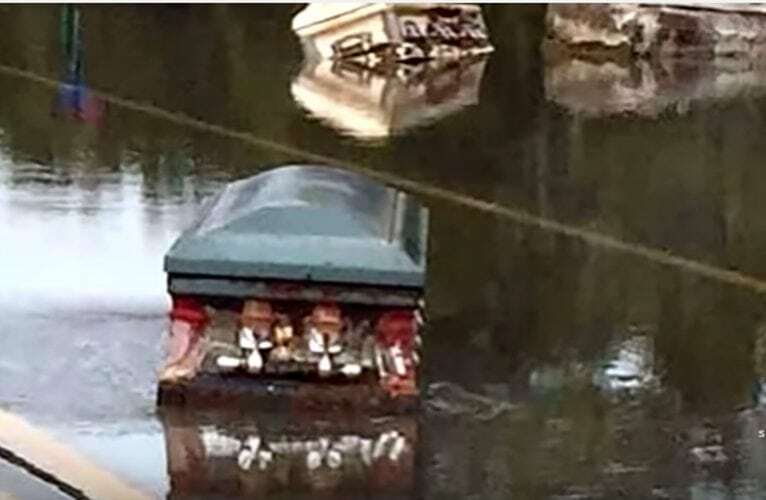 The waters may have receded, but the coffins that were floating through the flood waters are probably high and dry in various places. Well you know, Obama’s golfing and that’s way more important than any silly flood. Never mind if the cemeteries were emptied out. It’s not as important as that 18th hole birdie shot, after all. We also see from the Gateway Pundit that Hillary is taking a break and isn’t planning to go to Louisiana.There is nothing on her official schedule until Sunday. Liberal media such as the LA Times and Politico are making sure that the narrative isn’t about Trump’s compassion for the victims, but that he’s doing it for the photo-op. They bashed Bush for his response to Katrina but are giving Obama a pass for golfing now. What was that about a photo op? Trump banned cameras from his visit, with the exception of the arrival. He’s done that frequently. They are said to be meeting with relief workers and citizens. Libs can’t see the forest for the trees- where is Obama? Where is Hillary? Where is BlackLivesMatter? Where are all the liberal fools that tell us how important their people are? They’re golfing, or taking a nap or planning their next riot while thousands upon thousands of people have suffered major losses. The Advocate, a Baton Rouge newspaper called out Obama to cut short his vacation and come to Louisiana. We reported this previously. He didn’t and won’t. But Trump and Pence took the time out of their rally schedule to go to Louisiana. Trump was said to have re-vamped his schedule to do it. So, America what do you want? A President who actually cares? Or will you liberals just sit around bashing the only person who is ready to help? Do you want a selfish President (and possibly a sick one), or one who gets things done for the people? Your call.